Next expansion of World of Warcraft, Mists of Pandaria, has an important announcement of the pet battle system. Many people have started to study and analyze the pet battle since beta. It is seems that some brand new things happened. 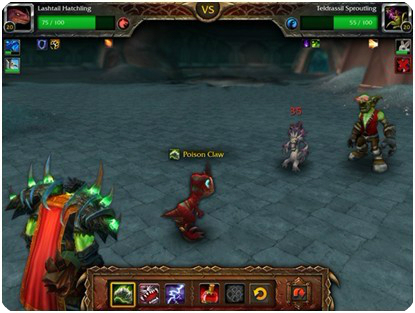 We are also like to share with you about the expected pet battle system. Usually, we can see in old expansions of WoW or in other games, the pets or companions won't be able to fight against each other when we are in battle with opponent. There's no individual combat system for pets. But now in Mists of Pandaria, we can bring our pets to fight. It should provide at least some amusement seeing Speedy the Turtle gnawing on a Personal World Destroyer or a Spring Rabbit going toe-to-toe with a Peddlefeet. 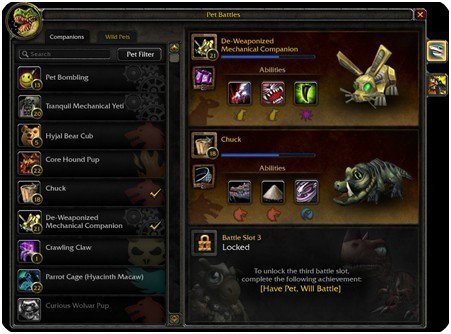 Companion pets are divided into categories in Mists of Pandaria, of which each has certain special abilities available to use when pets are in combat. They may have 6 or 7 unique abilities. Though we have only seen several of those abilities, there is the possibility of more be added. So far 11 types of companion pets have been revealed, including animal, beast, critter, dragon, elemental, flying, humanoid, mystical, mechanical, undead and water. By sending your pet to fight another player's pet, you can start the combat between pets. Winning pet may have chances of leveling up and can learn new ability from pet trainer NPCs. Some of these abilities can only be learned by successfully winning a fight against the NPC's pet. This gives you more chances to train your pet in fighting. Assume you have a knack of training, you can then train good pets and sell them. Because pets can be traded in Mists of Pandaria. Resources used in combats are called Power and all abilities also have an Accuracy rating. The fray is organized into turns and many ongoing effects and abilities last for two or three turns in order to define their duration. Some effects come first in a turn, while others are most effective if you wait until the end of the turn to activate them. Blizzard's new pet battle system for Mists of Pandaria looks like a solidly imagined and well-developed mini-game with enough variety and detail to keep your interest and give you a sense of development and accomplishment – and something different to do in the World of Warcraft.